Regular maintenance of your sword is a vital part of keeping your weapon in good condition over time. Our Sword Maintenance Set includes a collection of the sword care supplies you will need to clean and protect your blades. 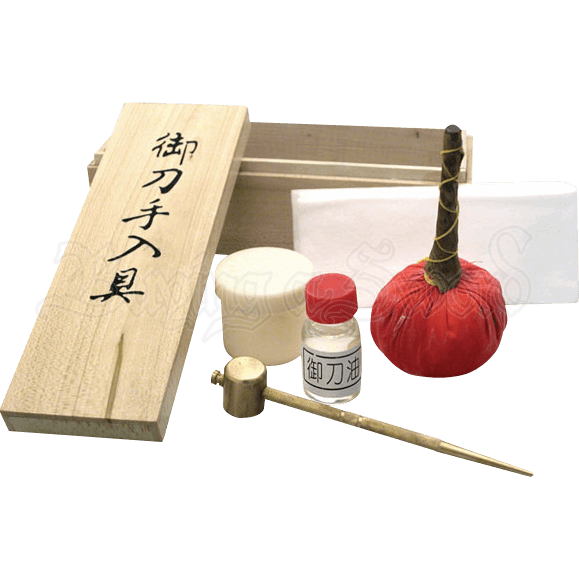 This sword maintenance kit includes a brass mallet, a supply of rice paper, a powder ball, sword oil, a plastic holding container, and a wooden storage box. The brass hammer can be used to remove bamboo pegs in the grip, though this disassembly should be avoided unless you have new replacement pegs since it can cause wearing over time and result in a loose grip. Rice paper works well for removing oil from previous maintenance. Then, after the powder ball has dusted the blade, clean rice paper can be used to polish the blade and remove the powder. A few drops of oil along each side of the blade can then be spread with clean rice paper to prevent rusting. Please note that extreme care is required when handling blades to avoid injury.